Video Insight supports distributed and centralized deployments. With increases in bandwidth, switching, and better compression, it's now possible to move the servers to a central data center. VI7 also supports integration with a number of industry leading access control manufacturers at no cost. Initial setup for HealthMonitor Cloud offers a quick and simple initial setup. Simply enter the IP server details into HealthMonitor Cloud management interface and begin monitoring IP servers and Cameras in no time. No fuss setup required by the end user! Health Monitor Cloud requires no additional database setup and is ready to use with the latest IP Server environment. No need for additional license purchases or third party software licenses. With HealthMonitor Cloud, IP Server system Integrators can monitor and track VIP customers to provide a pro-active customer-friendly service, keeping them happy for years to come. Online tools allow dealers and integrators to independently manage end users with confidence and trust. HealthMonitor Cloud keeps a detailed log of server and camera statuses and service availability. This detailed log is built into the main dashboard and is immediately available to end users and dealer accounts alike. HealthMonitor Cloud offers an easy to read, sortable dashboard view which allows you and your clients to quickly glance over the status of a Server and check it’s functional status. If there is an error on a server, it is easily selected and a greater detailed view of potential errors is then displayed. Camera availability is only half of the battle; don’t get caught with unrecorded video! HealthMonitor Cloud ensures that you do not miss a beat and keeps track of the cameras recording status. Additionally, with future feature sets in the works, a camera and server historical data report for annual, monthly or weekly review. Email notifications will keep you on alert in the event a camera or server changes status. Emails can be customized by Subject, and body text for quick organizing later. Send email alerts from your own mail servers. This feature allows dealers complete control over deliverability for sending/receiving health monitor alerts. For custom OEM partners, managed environments are just as easy to setup with a quick setup wizard. Personalized technical support is available to assist for individualized help. The Video Insight Server can write to a single drive, multiple drives, or each camera can be pointed to a unique drive. 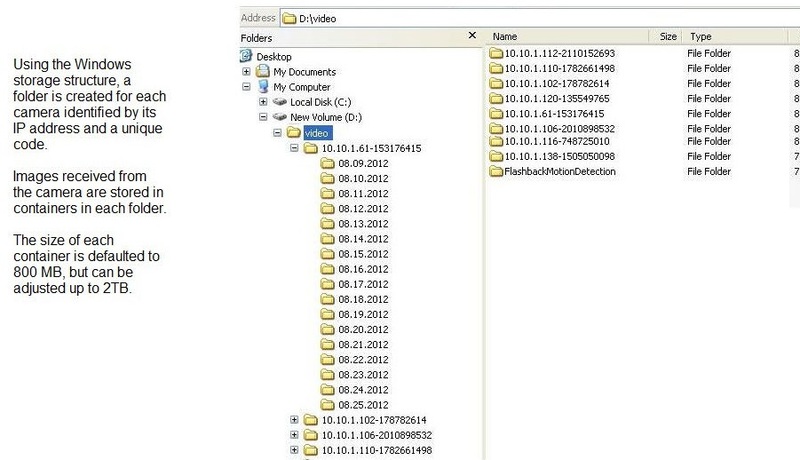 The Server creates a folder structure that is organized by IP address and date and time. By default, the Server will use all available storage in the designated path and overwrite the oldest video when necessary. The amount of storage is determined by the bitrate of each camera and how much of that will need to be saved. For example, a 1.3 Megapixel camera set at 10 FPS can be configured to stream video at 1.5 Mbits/sec and if the camera is recording motion at 50% of the time, then we can estimate we need 7 GB of storage per day. Click here for the VI storage calculator. Video Insight supports all storage that Windows can address. In addition to the size of the storage, it's necessary to confirm the storage system can handle the amount of video — otherwise video can be lost when the storage is overloaded. To calculate the maximum storage throughput we must assume all cameras will write simultaneously and add up all camera bit-rates. Since most storage systems refer to their maximum simultaneous write speeds in Mbytes, divide the total camera traffic by 8 to convert it to MB. For example, let's assume you have 100 cameras that will stream at 3Mbits/sec or a total of 300Mbits and we expect them to record 50% of the time. The storage system must be able to write 37.5 MB/sec at its maximum. Video Insight has developed a storage speed test to confirm your systems capability. Click here for the VI Hard Drive Speed Test. Hard drive manufacturers offer a wide variety of drives, offering different speeds and MTBF rates. When selecting drives, consider that video surveillance applications write data continuously but have far fewer read requests. This differs from typical file server operations where the hard drive is reading and writing simultaneously. To provide the maximum protection to your data, we recommend using RAID5 with a designated Hot Spare. RAID5 allows for a single drive to fail without data loss and by designating a Hot Spare, the system will automatically rebuild the RAID on failure. 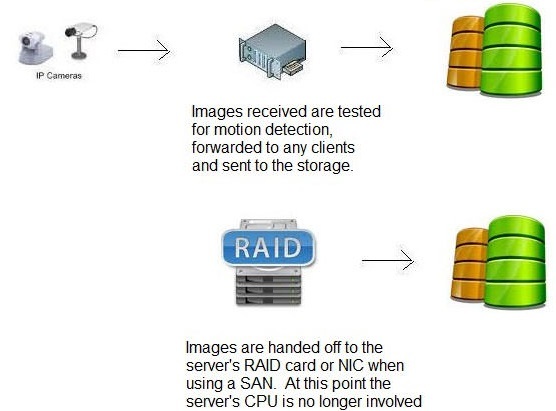 Ensure your RAID card can handle the camera’s traffic as described above and for larger deployments, hardware based RAID with onboard cache is preferred. Dell PowerEdge R720xd with (12) 4TB drives providing a usable storage of 36TB The Dell H710 PERC RAID card has a maximum storage throughput of 313.65MB/sec with continuous writing of 115 MB/sec. Dell PowerEdge R520 with (8) 3TB drives providing a usable storage of 19TB The Dell H710 PERC RAID card has a maximum storage throughput of 313.65MB/sec with continuous writing of 205 MB/sec. Our preconfigured NVR options can also address your requirements. The Video Insight Server supports all Windows addressable storage. Current customers are using storage solutions from Dell, EMC, HP, Isilon, and others. The Video Insight Server supports Automated Failover at no additional software cost. When utilizing the Video Insight Single Database configuration, a physical or virtual server can be designated as a Failover. This server will monitor the other servers and inherit the cameras of a failed device. For example, if we have the five servers with one designated as a Failover, when one of the four stops writing information to the SQL database, the Failover Server will assume the role of the failed server and all camera traffic will now be associated with that server. Once the failed server is put back into service, restarting the primary server will move the cameras back to their original location. Video Insight includes a standalone user management system or integration with Active Directory, LDAP, and Novell eDirectory. When using AD or LDAP, administrators create an active connection to the AD Server providing real time authentication. 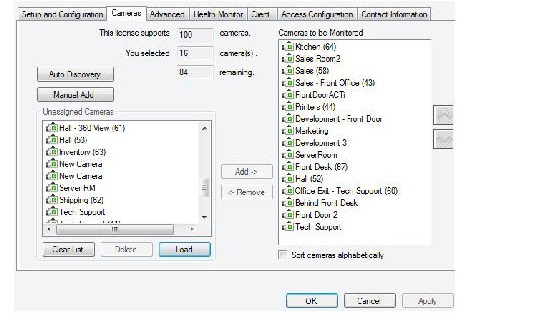 Video Insight stores all camera-related settings in a Microsoft SQL Server database. 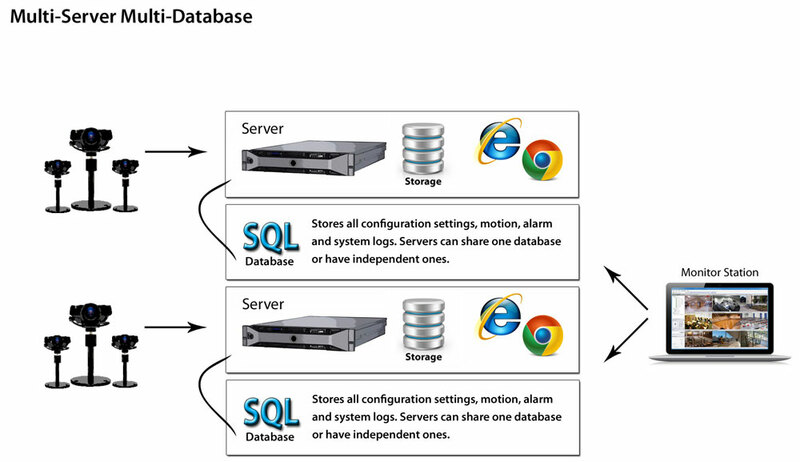 In multi-server configurations, a single database can be used to store all settings. Using a centralized database has a number of benefits including automated failover, but it also allows administrators to easily move cameras between servers. For example, let’s assume you have 100 cameras spread across two equally-sized servers, but one of the servers is only keeping 20 days of recorded history instead of the desired 30 days. Using the Camera Setup tab, you can easily move cameras between servers with a few mouse clicks. Video Insight supports all virtualization platforms, including VMware, Microsoft Hyper-V, and Citrix XenServer. Virtualizing your surveillance allows you to leverage existing infrastructure as well as create a perfect environment to test and deploy. The Video Insight Software Development Kit (SDK) is an application programming interface that provides the ability for third-party software developers or supported OEMs to develop their own client-side applications to access live and recorded video from Video Insight servers via an interface provided by Video Insight. The SDK application programming interface is supported by Video Insight and is used by our Web Client as an Active X control. This support guarantees the developer that the interface is used by our main product lines. As new cameras, compression types and functionality are added to our main product line, this Active X will be updated in a manner that the existing code will be functional with new server features. Wide camera library: Video Insight supports over 3,000 cameras from 100 manufacturers. Add video: The SDK makes it easy to add video functionality to security systems-all that is needed is a basic understanding of .NET. For developers, the SDK is available free of charge. SDK Support is available. (Variable fees will apply based on hours of support requested). Retrieve a list of cameras, with the user’s appropriate live, playback, and PTZ permissions if security is enabled. If security is not enabled, the complete list of cameras at the server is returned. Show resizable live video in a new window or in the same window. Look up a camera’s recorded video files. Play recorded video in a new window or in same the window, both resizable, and with or without player controls. Player control buttons and the slider bar are fully customizable. Send pan-tilt-zoom operation commands to PTZ cameras, and recall presets if available. Send SDK events to trigger predefined rules at the server. Send a command to the IP Server 4.1.5 to fix a corrupt video file. The Monitor Station client is used to configure and administer Server settings. In addition, the Monitor Station provides administrators a robust set of tools to optimize server performance including bit rates, last image received, FPS, and resolution. Video Insight uses a Microsoft SQL Server database to store system settings, user permissions, activity, alarm, and system logs. Video is not stored in the SQL Database so the database can be installed locally on the server and multiple servers can utilize one database. 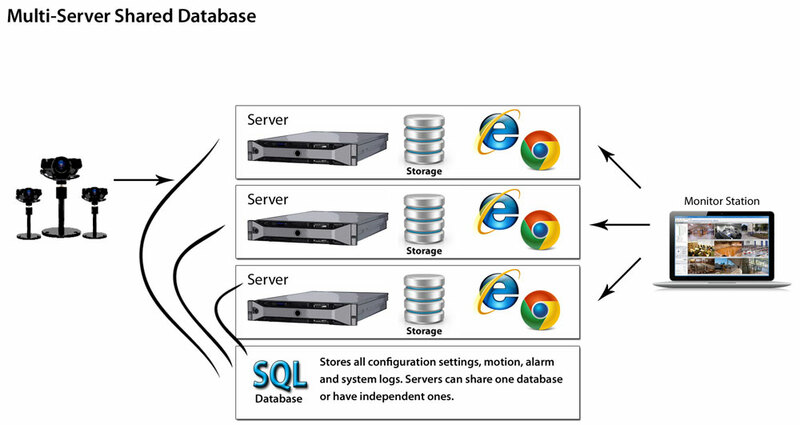 In addition, the SQL Database can be installed in a central location for multiple systems to share. When using the Monitor Station users do not see a difference when using a single or multi-database configuration. Microsoft SQL Server Express is installed during the standard installation of Video Insight. For installations that have existing SQL Servers already running, the Video Insight Servers can utilize a single database providing additional redundancy of the database. The database size will vary based on the amount of motion alarms. In environments with higher motion activity, the actual size of the database could be larger. 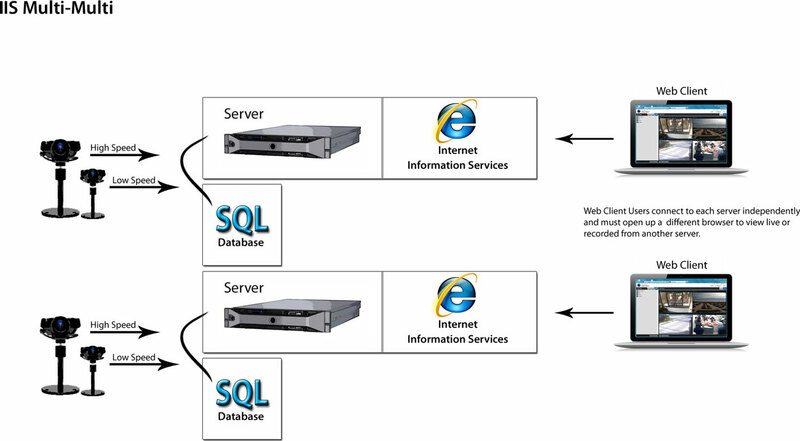 Video Insight utilizes Microsoft Internet Information Services (IIS) to power the Web Client. IIS is installed as a component of Windows and simply needs to be enabled for most OS versions. 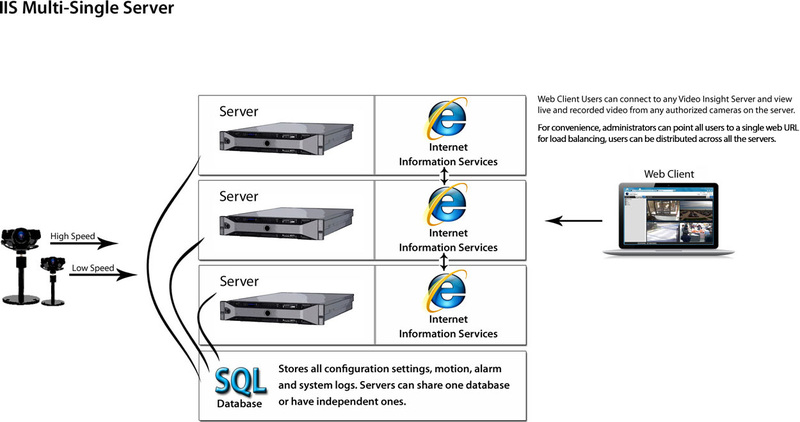 Each Video Insight Server will utilize IIS on the local server, and with the use of a shared database, can power the Web Client for use with any server load-balancing. Administrators can point users to a single URL address and the Video Insight Server with IIS will pull the live and recorded video from the appropriate server. For load balancing purposes, groups of users can be pointed to different Video Insight Servers. This decreases the amount of inter-server traffic. Video Insight supports all of the IIS versions of the supported Operating Systems. The Video Insight Web Client supports two transmission methods referred to as Low and High Speed mode. When using Low Speed mode, the Web Client receives MJPEG images and when in High Speed mode, the client receives the camera's native compression. IIS handles the transmission and its process is not CPU intensive. When considering the number of Web Client users per server, the most important consideration is the cumulative bandwidth required. Video Insight supports distributed and centralized deployments. As an example, let's use a school district that has 25 campuses. Traditionally, this required each campus to have servers, requiring space, power, security, and air conditioning. With increases in bandwidth, switching, and better compression, it's now possible to move the servers to a central data center. Centralization can also mean centralizing existing DVRs and NVRs into a single solution. For example, a high school might have 10 DVRs spread across the campus. Using solid-state video encoders, all the video can be sent to a single NVR. Will the network bandwidth support the IP camera traffic? How redundant is the network? Can we use SD cards for onboard storage? The Video Insight Server can support multiple network interface cards (NIC) and traffic can be segmented by type. A common configuration is to isolate camera traffic on one NIC and connect a second NIC to the corporate network. This isolates all camera traffic, ensuring it does not affect normal traffic. 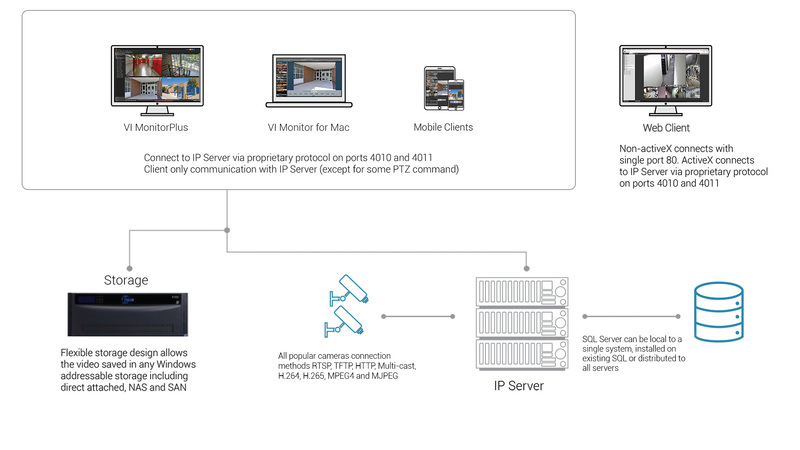 In addition, the Server can support camera traffic from multiple NICs. When using the Web Client, IIS handles all internal routing and can support inbound traffic on all NICs, but the server listens for the Monitor Station on a single NIC. As processing power increases, camera manufacturers are adding more features to cameras. In addition to H.264 compression and enhanced onboard motion detection, analytics, like directional direction and enter and exit filters, are becoming common. 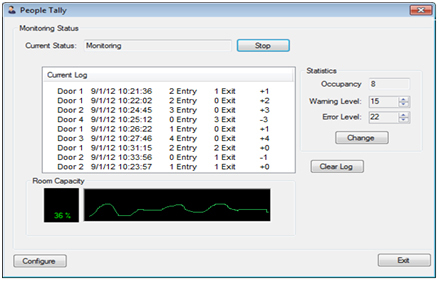 These analytics allow rules to be configured to do object counting or alarms when a vehicle enters an unauthorized area. 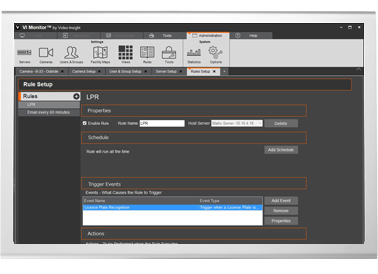 The Video Insight Server accepts these inputs and allows users to set up automations based on their trigger. For example, the following uses a counting analytic to notify the operator if the number of people in a room exceeds the specified threshold. Bandwidth is the primary challenge associated with hosted video, but the second challenge is the backend server. Most VMS platforms specify 120 or fewer cameras per server. In a hosted environment, this server requirement can dramatically increase the deployment costs. Video Insight v5.5 has been designed for Hosted Video with single OS support at over 2,000 cameras per host. Call us for a more detailed overview of our hosting offering. Minimum specifications depend highly on total camera load placed on each individual server, and total bandwidth availability of network which the cameras reside on. Please consult with a Panasonic sales professional for accurate system requirements based on your site's needs.